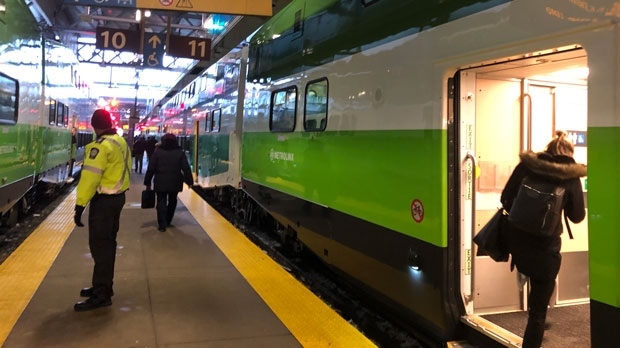 GO Transit riders boarded the newly reintroduced express train, which runs between Union Station and Kitchener, for the first time since early January. A spokesperson from Metrolinx said that the decision to bring back the 4:50 p.m. train was made after commuters expressed concern over overcrowding along the Ktichener GO line. “We heard from them loud and clear. This is a service that they really need,” Amanda Ferguson told CP24. The service was previously cancelled by the Progressive Conservative government as part of some changes to the Kitchener GO line. Many customers took to social media to complain about the changes, posting photos of packed platforms and of riders standing in the corridors on the trains. Metrolinx added two more coaches to the 5:02 p.m. train leaving from Union Station to help ease the overcrowding, but Brampton Mayor Patrick Brown said that it wasn’t enough and wrote an open letter to the Minister of Transportation asking them to reconsider the cancellation of the express train. On Jan. 28, Phil Verster, the CEO of Metrolinx, announced that the 4:50 p.m. express train would be brought back and apologized to customers. “I’m excited about the fact that it’s back because it allows me to get home at a better time,” another rider said. The train runs express from Union Station to Bramalea GO Station and then services all stops to Kitchener. Metrolinx said the new train will provide more than 1,000 new seats during the afternoon commute.